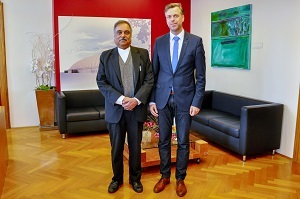 Novo Mesto - The Novo Mesto Mayor Mr. Gregor Macedoni hosted the Ambassador of India to Slovenia Mr. Param Jit Mann at a working meeting yesterday. The purpose of the meeting was to enhance contacts and explore opportunities for cooperation in the economic and cultural fields, the Municipality of Novo Mesto communicated. The Mayor presented the history of Novo Mesto to the guests as well as the key achievements in culture, economy, education and sports and presented the future development plans of the municipality. Moreover, the Director of the Chamber of Industry and Commerce of Dolenjska and Bela Krajina Tomaž Kordiš and the Director of the Novo Mesto Development Centre Franci Bratkovič joined the mayor in the presentation. The Indian delegation was presented the possibilities of cooperation in a range of fields, the municipality press release said. The Ambassador expressed hope that the ties between Novo Mesto and India are enhanced in the economic and cultural fields and said they were open for cooperation. The Indian delegation was impressed with the children’s education programme on robotics and programming as well as with the integration of Lego building toys carried out by the Novo Mesto Development Centre and the water management system in the Novo Mesto Municipality which could also be transposed in the Indian system as an example of good practice, the municipality said. The Ambassador of India and the delegation also paid a visit of the Primary School Novo mesto Center, and will visit Krka at the beginning of April. The school headmistress Ms. Marta Pavlin presented the special features of the school and the Slovenian education system to the guests, and the pupils had a music-dance performance and conducted a quiz about India.